For the last two versions of Android, that is Android Lollipop and Android M, the developer preview versions have been kept just Android L and M, without revealing their names until they are officially sent out to devices via OTA update and this time, the mystery seems to get darker and darker, google released a music video which teases possible Android M names and I must admit that the video is a cute one, and I liked it. The video was created and performed by Google employees Nat and Lo and was set up in the Android garden at Google’s headquarters, where lawn statues of the current Android mascots reside. 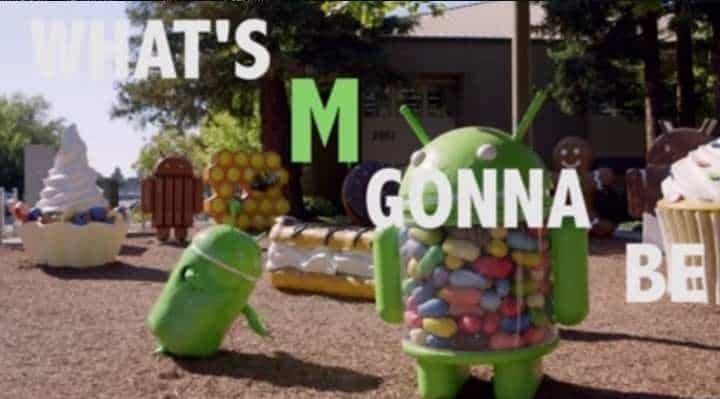 As the music starts, the video goes on showing the list of various possible names for Android M including Marshmallows, Milkshake, Muffin, Maple Syrup, Marzipan, Macaroon, M&M, Moon Pie, and it continues, and finally it says: “What’s M gonna be?” Watch the video below. The video ends with a scene of a man spray painting the bottom half of an Android statue white instead of the usual Android green color. This has lead many to speculate that Android M is indeed going to be Android Marshmallow. This name has been predicted many times as Android M was announced this year at Google I/O. Also it may be possible that developers are using Marshmallow as the internal codename to keep the real name of Android M as a secret. We just need to wait and watch till Google officially send it with new Nexus devices that are gonna be launched later this year.